Late in 2010 we received an email from Alex over in Adelaide asking whether we would be willing to support his new Dungeon Bowl tournament. Dungeon Bowl is a game well suited to 2.5D and 3D representation - so we jumped on board, filling the major sponsor position. The tournament itself was a success, with Alex and his fellow organizers learning a lot along the way. When the tournament was over Alex sent a bunch of photos showing our product in action. 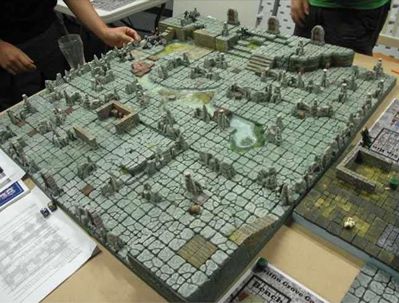 Most impressive was the Grand Dungeon, the Dungeon Bowl pitch used for the grand final match. It was quite a build! Like any arms race the 2012 tournament had to be bigger and better than the previous year. The same was certainly true of the Grand Dungeon. Where 2011 was a 2.5D pitch, 2012 went truly 3D. When it comes to 3D builds height is everything and the 2012 endzone was a beauty. 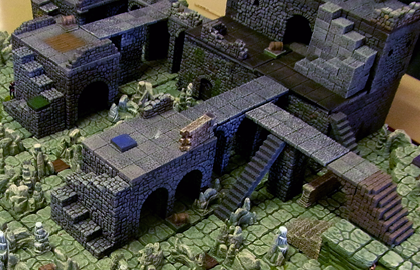 When we saw the photos we were very impressed; once again Alex and his crew had done an outstanding job of ensuring that the Grand Dungeon was a real showcase of our product and their skills and vision. This year's Grand Dungeon was simply inspirational. 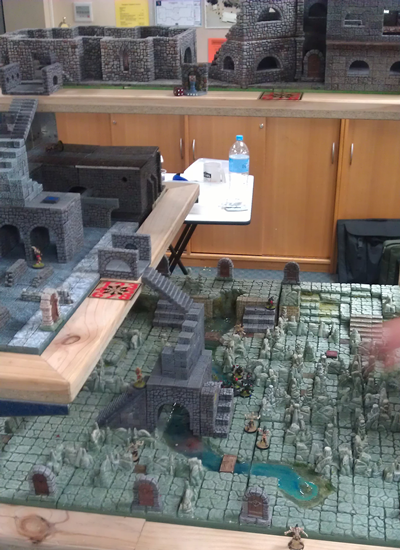 The table on which the Grand Dungeon rests was a custom built display table created by one of the club's member using offcuts of wood and sheet metal, MacGyver-style. It was a rock-solid three-tiered beauty. On it sat the Grand Dungeon in all its glory. More height than 2012 -- much more. A better paint job than 2011 and 2012. An outrageous Dungeon Bowl pitch design. What a showcase of our product and their talents! Of course there is far more to the Adelaide Dungeon Bowl Competition than the Grand Dungeon. Alex and his colleagues continue to present a great little tournament. Each year there are more particpants, more prizes, and a better run tournament.